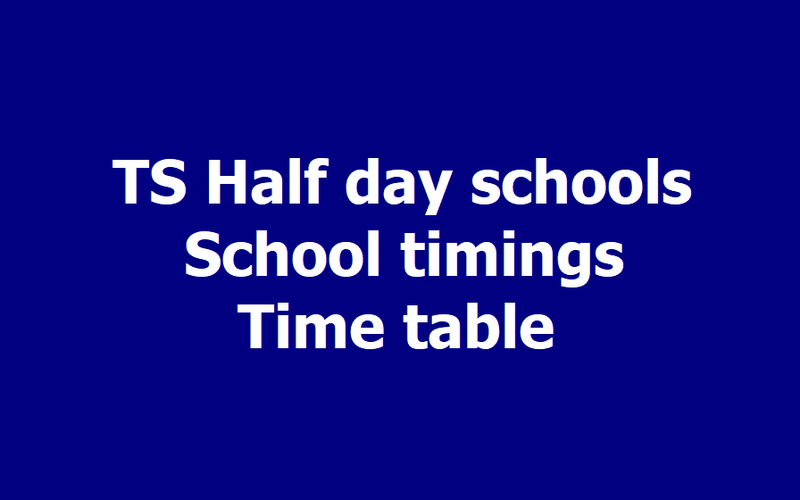 TS Half Day Schools from March 15th, 2019, TS Half day Schools from March 15, School timings,Time Table, Periods for 2018: The Director of School Education, Telangana State Hyderabad has given proceedings to all the Regional Joint Directors of School Education and all the District Educational Officers in the state and certain instructions would be issued to above said officials on "Half Day Schools during Summer from March 15th, 2019. TS Schools. 1. వేసవి దృష్ట్యా తెలంగాణలో మార్చి 15 నుంచి ఒంటిపూట తరగతులు ప్రారంభమవుతాయని పాఠశాల విద్యాశాఖ డైరెక్టర్‌ విజయ్‌కుమార్‌ తెలిపారు. 2. ఏప్రిల్‌ 12 వరకు (విద్యా సంవత్సరం చివరి తేదీ) ఉదయం 8 గంటల నుంచి మధ్యాహ్నం 12.30 వరకు తరగతులు ఉంటాయని పేర్కొన్నాయి. 3. పదోతరగతి పరీక్షల నేపథ్యంలో కేంద్రాలుగా ఉన్న పాఠశాలల్లో పరీక్షలు జరిగే రోజుల్లో మధ్యాహ్నం ఒంటి గంట నుంచి సాయంత్రం 5 గంటల వరకు తరగతులు జరుగుతాయని వివరించారు. 4. అన్ని పాఠశాలల్లో ఒంటిపూట తరగతులు జరిగేలా చర్యలు తీసుకోవాలని జిల్లా విద్యాధికారులు, ప్రాంతీయ సంచాలకులను ఆయన ఆదేశించారు. Subject: School Education, Mahabubabad - Communication of time table for Half day schools during summer and implementation of option holidays for high schools for the year 2018-19 for all managements -Orders Issued - Reg. 1. Director of School Education, TS, Hyderabad Rc.No.843/Plg-1/2018-1, dt: 07.03.2019. 2. Commissioner and Director of School Education, TS, Hyderabad Rc.No.843/PIg-1/2018-1, dt: 17.03.2018. All managements of Primary/Upper Primary/ High Schools in Mahabubabad district as per the subject and reference cited above, implementation of half day schools during summer and optional holidays for high schools as given here under. ➢ Half day schools during summer i.e., from 15th March, 2019 onwards till last working day i.e., 12th April, 2019 of the academic year 2018-19. Mid Day Meals shall be provided at 12.30 PM. ➢ School timings in case of schools with SSC Examination centers curriculum transaction shall be from 1.00 PM to 5.00 PM. Mid day meals should be provided before commencement of school timings. In this regard, all the Headmasters are instructed to follow the above timings for all managements in Mahabubabad district if any deviation the Headmaster will held responsible. Subject: School Education - Implementation of Half Day Schools during summer and implementation of optional holidays for high schools - Orders issued - Reg. All the Regional Joint Director of School Education and District Educational Officers in the State are hereby informed that implementation of half day schools during summer and optional holidays for high schools as given here under. Half Day Schools: Half Day Schools during summer i.e from 15th March onwards till last working day i.e 12.04.2019 of the academic year 2018-19. The schools i.e Primary, Upper Primary and High Schools of all managements i.e both Govt., Govt. Aided and Private management will function from 8.00 A.M to 12.30 P.M. Mid Day Meals shall be provided at 12.30 P.M.
Subject: School Education - Academic Calendar for the year 2018-19 - Certain Instructions - Reg. 2. This office Proc. Even no. Dt:30.05.2018. All the RJDSEs and DEOs in the State are informed that, clear instructions have been issued by the Government and by the Commissioner and Director of School Education, TS., Hyderabad vide references read above, informing all the RJDs, DEOs and MEOs to reopen the schools from 01.06.2018 after summer vacation and to celebrate the State Formation Day on 02.06.2018 and that schools will be run on 'Half Day' basis from 4 June, 2018 to 8 June, 2018. In these Proceedings, mention was made regarding the conduct of Badi Bata Programme from 4 June, 2018 to 8 June, 2018 in the mooring hours i.e., from 07.00 AM to 11.00 AM. Misinterpretation of these instructions is noticed stating that schools are going to run on 'Half Day' basis from 07.00 AM to 11.00 AM. This does not pertain to the students of the schools. Thus, the schools will run on 'Half Day' basis from 08.00 AM to 12.00 PM from 4 June, 2018 to 8 June, 2018. Therefore, they are requested to take immediate necessary action in the matter. 1. The attention of the Commissioner and Director of School Education Department, Telangana, Hyderabad is invited to the reference cited. 2. Based on the representations made by the Teachers Unio and Parents Association to the O/o the Commissioner and Director of School Education, TS, Hyderabad to extend the vacation due to the Hot Summer. it is decided that the classes will be reopened as per the Academic Calendar from 1st June 2018. schools will be run on Half Day basis. 3. The State Formation Day will be celebrated on 2nd June 2018 and 4th June 2018 onwards upto 8th June 2018, the schools will be run on Half Day basis. 5. The Commissioner and Director of School Education, Telangana, Hyderabad is requested to instruct all the concerned accordingly immediately, by today. Sub: School Education, Telangana - Implementation of Half Day Schools during summer and implementation of optional holidays for high Schools - Orders issued - Reg. Ref: Minutes of the meeting held by the Hon'ble Dy.C.M& Minister for Education on 17.02.2018 with the Teacher Joint Action Committees at Secretariat. All the RJDSEs & District Educational Officers in the State are hereby informed that,. vide ref. cited the orders are now issued on the implementation of half day schools during summer and optional holidays for high Schools as given hereunder. Half day Schools: Half Day Schools during summer i.e., from 15th March onwards till last working day of the academic year 2017-18. The Schools i.e., primary, upper primary and high Schools of all managements i.e., both Govt., Govt., Aided and Private managements will function from 8.00 am to 12.30 pm. In respect of High School having SSC examination centers, the school timing will be from 1:00 P.M to 5:00 P.M as per earlier orders in vogue. Utilization of Optional Holidays for High Schools: Optional Holidays will be applicable for Schools rather than individual teachers. The earlier practice of utilization of Optional holidays to the institutions shall be continued. 3- Recording results and parents meeting on 11.04.2018 and issue the progress report to children. 4- Students resubmit the progress report to school after parents signature - 12.04.2018. Directorate of School Education - Implementation of half day schools during summer and implementation of Academic Calendar for the year 2017-18 from 21st March - Certain instructions - Reg. l.Proposals from DSE, TS., Lr.Rc.No.405/C&T/SCERT/2015, dt.16.03.2016 and 04.06.2016. 2. Govt. Memo. No.2497/Prog.II/Al/2016, dt.07.06.2016. 3. Proposals from Director, SCERT. 4. Meeting with Sri Kadiyam Srihari, Hon'ble Dy CM and Minister for Education and Special Chief Secretary, Education Department and Commissioner & Director of School Education, Telangana, Hyderabad dated.10.03.2017. All the RJDSEs and DEOs are hereby informed that vide reference 4 cited, detailed instructions are given hereunder on the implementation of half day schools and next academic year from 21st March onwards. I. Half day schools - Vide reference 4 cited, it was decided that the half day schools will continue as usual from 15th March 2018 to 12th April 2018. THe SA2 Examinations from 8th and 02 April to 12th April, the District Educational Officers are instructed to conduct the examinations on the above days. In the High Schools with SSC Examinations centres the school timings will be from 1.00 PM to 5.00 PM as per earlier orders in vogue. II. Implementation of academic year for 2018-2019 from 1st June 2018 - The academic year for the year 2017- 18 will commence from 1st June 2018. The Head Masters shall be instructed to start the syllabus from June 1st onwards and give some assignments, projects to the students during summer vacation. Accordingly the HMs must plan for drafting teachers for invigilation i.e., non language teachers for language subjects and language teachers for non language subjects. In addition to starting of the syllabus, the HMs must take up remedial teaching for the children who are unable to read and write and perform basic arithmetic operations. III. Text Books distribution and maintaining Book Bank - All the District Educational Officers are instructed to take necessary action for the distribution of text books to the children on the 1st June 2018. Therefore the HMs have to personally attend the Mandal point and collect required text books before June 1st. The State level observers are being deployed for monitoring of SSC exams shall also monitor the transportaion of text books to the schools and distribution to the children properly. All the HMs are requested to deposit the text books from outgoing students who are promoted to the next class and maintain the book bank as was done last year. In case if any text book not reached to the school, books may be arranged from the book bank for time being till new text books reaches the schools. IV. Implementation of 3-R's Programme (Improving the basic competencies in reading, writing and arithmetic for all students in primary,Upper Primary and High Schools) : In addition to the starting of the syllabus from 1st June onwards, the HMs must also plan for conduct of remedial teaching for the children who are unable to read, write and perform arithmetic. As per the survey from ASER and as well as School Education about 40 to 50% of children are unable to read and write in mother tongue and about 60 to 70% in English. Similarly children are very poor in basic arithmetic operations. Therefore all the Head Masters of Primary Schools, Upper Primary Schools and High Schools shall take up special remedial classes for the children separately ..........with conducting some Baseline test and also Endline test for assessing the improvement. The existing material in schools i.e, SLIM cards, library books and Class I and II Text books may be used for the strategies to improve the basic competencies. For this the Head Master need to conduct a meeting with staff and define the roles and responsibilities of each staff member and timings for remedial classes, strategies, targets and develop plan of action for improvement with specific targets. At the end they should conduct one endline test and furnish the report on progress to the concerned School Complex Head Master and Mandal Educational Officers. All the School complex Head Masters are responsible in their complex area for the implementation and improving the basic competencies. V. Badi Bata - The Badi Bata programme is scheduled from ..................... in all the schools in the State. A detailed day wise programme shall be communicated shortly. All the HMs have to prepare school profile and update the Village Education Registers (VERs) immediately for conduct of Badi Bata i.e., distribution of handouts, posters, list of out of school children, child labour etc. Therefore all the RJDSEs and DEOs are directed to take appropriate action and see that the schools run seriously and conduct academic proceedings, as indicated above in both Government and private schools as per the schedule. The Telangana School Education Department has decided to restrict school timings to half-a-day from March 15. In the wake of the demand of the school teachers association to reduce the school hours owing to soaring temperature in various parts of the State, the Department of School Education conceded the demand on Friday evening in a meeting convened by Deputy Chief Minister incharge of School Education Kadiyam Srihari along with representatives of the government teachers association at the Secretariat. As per the revised timings, classes for six subjects will be held from 8 am to 12.30 pm. Students will be provided with an interval of 20 minutes from 10 to 10.20 am. Though the new academic year is scheduled to be held from March 21 to April 12. So, all government and private schools in Telangana State would work half day from March 15th, 2018. The government declared half day schools on 01/3/2018 from in view of summer setting in. Schools will function from 8 AM to 12.30 PM. In this regard the Director of School Education instruct to run the schools for half - a - day from 8.00 A.M. to 12.30 PM due to summer from 15.03 2018 onwards, and further instructed to run the schools which are constituted as S.S.C Examination centre from 1.00 P.M to 5.00 P.M. Yielding to the demands by the government teachers’ associations, Telangana government on Friday has decided to continue half-day schools from 8 am to 12.30 pm. A decision to this effect was taken during a meeting convened by Deputy Chief Minister and Education Minister Kadiyam Srihari with the representatives of the Government Teachers’ Associations at the Secretariat here on 10/3/2016. “Though the academic year begins from March 21, students will be taught reading, writing and arithmetic skills, but syllabus of the class will not commence. A final decision to start syllabus of the next academic year from March 21 has been taken by Chief Minister,” according to Teachers Unions. Although majority of teachers unions have agreed to academic calendar on the lines of Central Board of Secondary Education(CBSE) and to do away with the half-day schools while drafting academic calendar due to harsh weather conditions prevailing, the teachers demanded that government roll back full-day schools system.